This lavishly romantic arrangement is sure to capyure your Valentine's heart! 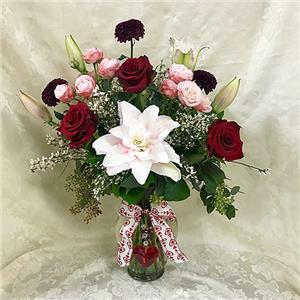 A stunning arrangement of Light Pink Rose lilies, Deep Red Roses, Rich Burgundy Disbuds and blush pink bombastic roses create this specatacular bouquet. White fragrant genestra and a medley of fresh greens combine and compliment the design. A beautiful jeweled heart and crystal beads adorn the neck of the vase with a ribbon bow accent. Flowers and colors subject to availability. Substitutions may be made.